How ContractorTools calculates and syncs taxes with QuickBooks. This is an article about taxes; how they are calculated in ContractorTools, and how they are synced with QuickBooks. Before we begin, let's first talk about the difference between "purchase taxes" and "sales taxes". "Purchase taxes" are what you pay when you purchase the materials and services that go into a construction project. When you purchase materials in a state that charges sales tax on those materials, the vendor adds a "sales tax" onto the purchase price. From the vendor's point of view, that amount is a "sales tax", and from your point of view, it is a "purchase tax". Many contractors don't think about paying "purchase tax", they just add it to the cost of the items in their estimates. But rather than manually calculating the purchase tax and adding that to your item costs, ContractorTools can be set up to automatically add the purchase tax to item costs for you. Please see the video on managing taxes for information on how to do this. "Sales taxes" are what you collect from your customers when you invoice them. ContractorTools can be set up to automatically calculate sales tax. Again, please see the video on managing taxes for information on how to do this. When you enter transactions in QuickBooks, or when third party apps like ContractorTools write transactions to QuickBooks, QuickBooks can automatically calculate the sales tax on those transactions. Unfortunately, this will not work with ContractorTools. The reason is a bit complicated, but it starts with the fact that (in many states) sales taxes for construction businesses have different rates depending on the "type" of cost: materials, labor, equipment, subcontractors, or other costs. Theoretically, it would be possible to set up different tax codes in QuickBooks for each type of cost, and then correctly assign each tax code to each transaction line item. But in order for ContractorTools to do that, it would be necessary for it to sync with the QuickBooks tax codes, and unfortunately, this is technically not possible, or so complicated that it is not worth attempting. A full explanation as to why is beyond the scope of this discussion. So, as a consequence, it is necessary for ContractorTools to override sales tax calculations for transactions written to QuickBooks. In other words, when ContractorTools writes transactions to QuickBooks, it cannot allow QuickBooks to automatically calculate the sales taxes, it must calculate the sales taxes and write those to QuickBooks. So how does it do that? As stated, when ContractorTools writes transactions to QuickBooks, it can either allow QuickBooks to calculate the sales taxes, or calculate and write them to QuickBooks to override QuickBooks' calculated sales taxes. ContractorTools does the latter. In order to override the QuickBooks sales taxes, ContractorTools must provide a tax code for each transaction line item, and the calculated sales tax amount(s) for the tax code(s) in the transaction. To do this, ContractorTools creates a "dummy" tax agency and tax rate in QuickBooks called "CT Tax Agency" and "CT Tax Code". The "CT Tax Code" rate is set to zero (0.0) because QuickBooks never calculates the sales tax for items with the "CT Tax Code", ContractorTools does. 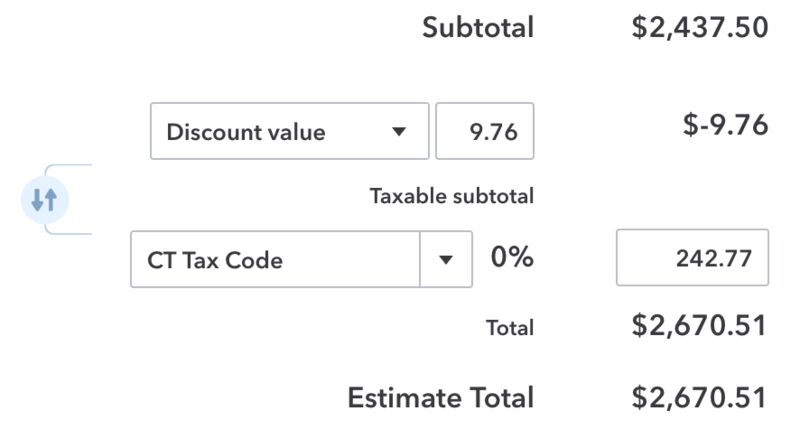 The tax code selected is "CT Tax Code", and while its tax rate shows 0%, the amount of taxes calculated by ContractorTools appears in the box to the right. Because taxes are calculated in ContractorTools, it is necessary to get your sales tax reporting from ContractorTools. To do this, ContractorTools provides the Sales Tax Report. To view the Sales Tax Report, go to the ContractorTools main menu and tap on Company Reports. The Sales Tax Report shows the sales tax amount for each invoice in each Tax Agency and Tax Entity by fiscal quarter, and the total sales amount, taxable amount, and sales tax amount for each quarter. The numbers reported in the Sale Tax Report are based on "accrual accounting" as opposed to "cash accounting". Accrual accounting recognizes income and expenses when they are incurred and cash accounting recognizes income when it is received, and expenses when they are paid. Many small construction business do accounting on a cash basis, not accrual, so why is the Sales Tax Report based on accrual and not cash accounting? The reason is because cash accounting recognizes sales taxes when customer payments are received and applied to specific invoices, but that requires payments to be applied to invoices, and ContractorTools is not able to do that (because it's very complicated). For this reason, if your company accounting is cash based, and you need to report sales taxes, you should sync ContractorTools with QuickBooks and use the sales tax reports in QuickBooks. The "Taxable Sales" amount reported in the Sales Tax Report may not agree with the "Taxable Sales" amount reported in QuickBooks if you apply discounts to any invoices that are synced with QuickBooks. The reason is because QuickBooks is not able to allow third party software (like ContractorTools) to write the taxability (taxable or non taxable) of items that discounts are applied to. Because of this, ContractorTools arbitrarily tells QuickBooks that discounts applied to materials are taxable, but discounts applied to other types of costs (labor, equipment, subcontract, or other) are not taxable.